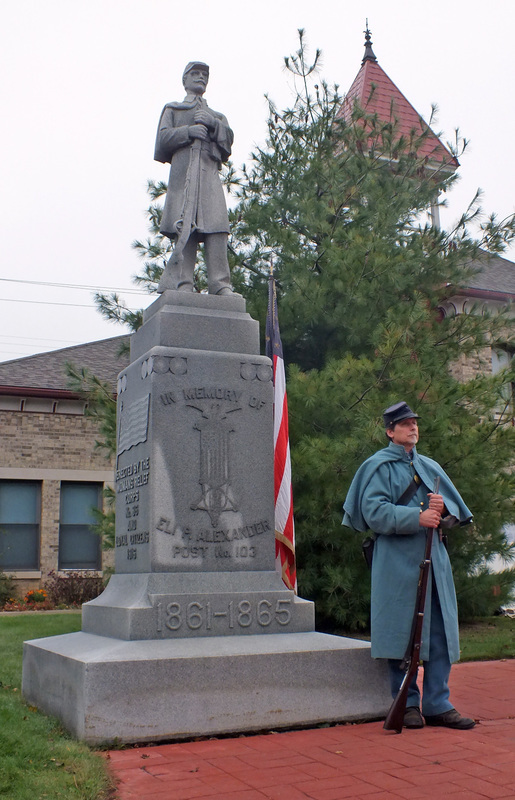 The 7th Michigan Volunteer Infantry Regiment, Company B, Civil War re-enactors were camped on City Hall grounds during the History Tour on October 4th. They conducted continuous military and domestic demonstrations, answered questions and periodically fired their muskets. Election Hullabaloo, 1872 - 2008 (Display contains artifacts on lean from the Michigan State University Museum as well as items from the Williamston museum's collection and some on loan from local residents. This is the last exhibit Val Berryman, former Curator of History at the Michigan State University Museum and Williamston Depot Museum board member, designed for our museum.) The exhibit featured memorabilia from past state and national elections and was in the museum from June until December, 2012. Elementary students routinely visit the museum. The photo at the right shows second grade students eagerly awaiting to participate in the 2011 Tour of Williamston. This program teaches students about their community. As they left, one boy was heard to exclaim "I love this place!" The Williamston Depot Museum entered a float in the parade. It featured Sue Neller's 1904 Curved Dash Oldsmobile, Old Steady. Also featured was a birthday cake commemorating the fact that the depot at 369 West Grand River was built in 1893, 120 years ago. On display were artifacts from four Williamston men's participation in the Civil War and their stories. Featured here is George Traver who enlisted in Company B, Sixth Michigan Heavy Artillery, Jan. 4, 1964, age 32. He was a private and served as a cook until the close of the war. He was discharged Aug. 20, 1865. In early May, 2014 121 students from Williamston elementary schools attended the annual presentations at the Williamston Depot Museum on Native American culture. 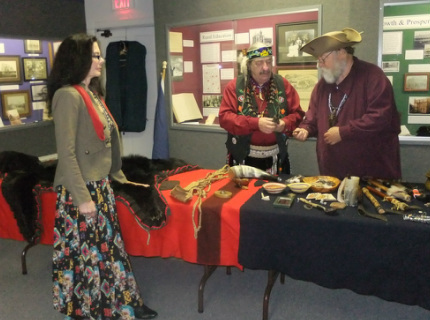 Educators from the Nokomis Native American Learning Center in Okemos were the presenters. Two of the presenters, dressed in Pow Wow Regalia, discussed the history, arts, and culture of the Anishinaabe (Ottawa, Potawatomi, and Ojibwa) people of Michigan. They used many artifacts in their presentations and the students were encouraged to examine the artifacts which included a variety of animal skins, moccasins, a purse made from the shell of a snapping turtle and a fan of turkey feathers. Other presenters dressed as French fur traders discussed trade between the Native Americans and the French and they used a large array of artifacts to enhance their presentations. Sam and Mary Engardio were imigrants from Sicily who owned operated a store in Williamston in the early 1900s. They had eight children, two girls and six boys. All six of the boys served in WWII. On June 21, 2014 two of those sons returned to Williamston and were the Grand Marshalls of the Red Cedar Jubilee parade. 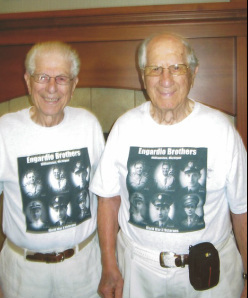 Frank Engardio, 95, came from California and Andrew, 91, came from Adrian, Michigan. Following the parade a reception was held in their honor at the museum. The festivities lasted two days with the children of the seven siblings who married and had families attending.